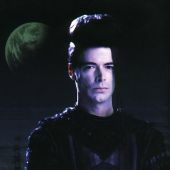 Final Episode - Yo Way Yo - Lexx Episode Reviews - Main Lexx Discussion - You have arrived in the LEXXVERSE where the spirit of Lexx lives on. Well, I hope I got the right place for that topic. I finally got the complete Series here over in Germany (UK Import) - since Season 4 was never published over here. I had read about Kai's death in the last Episode, but I had no idea what qould run loose after that episode... I started crying the whole evening, even when lying in bed. Even next day (today) when waking up... My husband was very irritated an asked my what was up with me an I told him how Lexx had ended. I would like to know, how you others here see that an if Michael McManus made a statement on this terrible end. First and foremost, welcome aboard! When Prince struck a deal to play Kai in a high stakes chess game, he chose his words very carefully. He said "I'll help you put your mortal soul to rest." When Kai went off to challenge him, one of the last things he said to Stan and Xev (paraphrasing) is that the one thing the dead want is to be dead. You could argue the case either way, but based on his words and actions (or lack thereof...for example, he expressed no such desire to retrieve more protoblood from the Cluster. That was all Zev's doing), it would seem to me that he never wanted to be brought back to life. All he wanted was the full, final, and complete death that he'd been denied for 6,000+ years. That he did it in a callous manner and got away scot free still doesn't subtract from the fact that in the end, Prince did him a favor. It's no accident that Kai was laughing during his final moments. Both at the irony of the situation, and because--in my opinion--he was overjoyed to finally be free. In other words, if Kai could speak to you from beyond the grave, I imagine the first thing he would say is "Don't cry for me." Hm.. I can agree with that so far. I think it is okay that he could die but the circumstances are so tragical that I am really upset about that. If he had just had a chance to life a whole life it would have been okay when he then faded away. But getting back to life just to sacrifice himself again after a few moments really is not fair. But I agree that in his way of life this second scrifice was again a good way to die for him. But a strange feeling of emptiness lasts for me because it had to end so shortly after given a second chance. I've only seen Yo Way Yo once and that was enough. I don't wanna watch it again for two reasons. One, I am a wuss, and two, I don't want to lessen the impact it had on me. I was very affected by the deaths of Kai and Lexx. There was much crying, and some might even say blubbering. Seriously, it was embarrassing. But I really think that was the perfect way to end it. If the ending had been happy, it would not be so memorable. I think that there probably were Brunnen G on Fire and water but we just did not see them. Kai's 'soul' is indeed reborn on Earth only to end up as a midnight snack for Xev after they mated. I think probably all of the souls who died in the Light Universe ended up on one of the two planets they just weren't all walking around at the same time. Remember Kai dives into the bowels of Fire to save Stan's soul, Prince shows him Stan surrounded by other souls. Prince tells Kai that Stanley is waiting his turn. Hm ... the Kai on Earth in the Dark Zone did not seem to be the incarnation of the Kai of the Light Zone... I think that it was an empty hull just looking like Kai and behaving like a poet. And - when I remeber right - Kai could not have been reborn, since he never died properly. So I don't think Earth-Kai was the reborn one. I think of him as a dim memory or poetical addicted tribute part of Kai. The time thing - yes it is said that they wait for their time. But in over 6000 years none of the Brunnen G did appear (at least not known). I think if they were reborn anytime they would probably have interfered with the story. Or perhaps their souls are drifing in time, waiting in some kind of parallel time/ plane like the theatre-crew is. And since the reborn somehow have dim ideas or memories whom they once was, a reborn Brunnen G would might have searched for Kai due to the Prophecy - or even his beloved girlfrind would at least have seeken fo him. I think we probably did not see them simply because they could not have added to the story. And Kai soul was indeed on Water. During the Beach Episode when Kai is sinking to the bottom of the planet I believe he saw his soul. This would have been the Kai reborn on earth. Hm, yes there was his soul on water. that's right. Warpax, welcome to the Lexxverse! I just wanted to address one thing that you said in your first post. Michael McManus actually really pushed the writers to have Kai killed off at the end. In fact, I think the whole chess game to get the promise of life from Prince was also Michael's idea, as a good way for Kai to finally die. I've seen at least one interview with Michael where he says this, so I'm not just pulling it out of left field. While I completely agree with you that it was heartbreaking and tragic, I also agree with why Michael wanted to do it. And I also agree with what others have said in their comments, that if he hadn't died, the final episode would not have affected me nearly as much or been as memorable. As far as a fanfic story of what happens after the final episode, please do!! With only a hint of him beeing reborn or rejoining his Brunnen-G people or something like that would have ... let's say "resten my soul". The impact of his death would still have been intense but I think such a tiny little hint in whatever way would have (at least to me) some sort of salvation as well. Hope that doesn't sound to silly. Warpax, if you really want to cry your eyes out, watch this Kai compilation set to Queen's "Who Wants to Live Forever". I came up with two ideas for two music-videos on my own. I hopefully get manage to finish and upload then somehow. And if this is coincidence= it is raining over here! I would love to see you fan fiction since I publish a weekly eZine for Lexx fan fiction. I'm always looking for authors! Yay! Warpax, together you and I can take that eZine by storm! !